So, with the world rapidly becoming larger due to the ability to connect with others on the internet, I've made some amazing 'friends' (whom I probably will never meet). "My mom lived with me, the last year of her life she was 90 when she passed away. I loved her living with me, we would play cards, and watch TV, go shopping, talk, laugh, plan menu's, plant flowers, we were more like friends than mother and daughter. Sometimes I would fall asleep on the sofa next to her, and awake with her asleep too...she would be holding my hand. Treasure the moments that you have with your mom...."
It's quite heartwarming to run across people such as Susan on the internet. I've 'met' other eHowers who also leave me nice messages and share their experiences with their own aging parents. What a surprisingly nice support group - one that I never even considered when I started playing around with writing articles again. Snow is falling and it's gorgeous out - we have probably 4-5 inches at the house here. The dogs were running like crazy around the backyard - I swear I can sometimes hear them laughing. We also have a new occupant here a the OK Corral - 'Jim Beam' (aka 'JB') the cat joined our crew last month. It took me only about 2 weeks to fully acclimate him to the dogs - he's running around the house right now keeping the mice away - haven't seen a mouse since he came in so it's working. He's quite a nice cat and quite BIG, weighing in somewhere around the 20 lb mark. He's got Rita beat by a mile. JB is FIV positive which equates, sadly, to Feline Aids. He's probably around 5 or so and quite healthy at the moment. I found him when a dear friend of mine (Nan) knew about his situation. Nan is also the one who hooked me up with The Paw Pad where we got dear wee Rita from. Anyway, JB was being cared for by a wonderful woman (Amy) and her husband down in Fairfax. He was homeless but, thankfully, Amy cared for him with food. Her dogs are cat-agressive so JB hung out mostly on her porch, awaiting any human contact. He's affectionate-hungry and loves to sit in my lap, curl up into a large ball, bury his head under my arm and drift off to sleep. Quite a change for a cat who once was chewed up and spit out by a pit bull. It's amazing to me that, given his background, he adapted so quickly to the dogs. In fact, this cat is much more dog than cat - he follows me everywhere. Did I mention that JB is LARGE? He loves to eat. Here he is drinking some milk while the dogs scarf up breakfast. 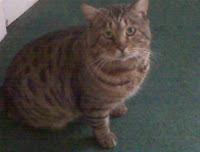 JB will remain an indoor cat as long as we're in this house - I cannot handle the heartbreak of killing yet another cat. At last sight, he doesn't appear to mind a bit - he's curled up on his bed sound asleep, safe, well fed, and warm. Here's the eHow I wrote about acclimating JB to the dogs - of course, when I wrote this eHow, I had NO clue how to acclimate a cat. I just did what made sense and it seems to have worked. Who knew? !